Innovation and Reality Meet Head-on. Arctic creek sailing is a new “pop-up” public art genre unique to Frederick, Maryland and it’s definitely not for the faint of heart. The challenges of keeping water craft aligned and tethered, bow and stern, in a narrow intermittently icy and extremely windy creek for 10 weeks of unpredictable winter weather present a daunting set of problems for designer/builders. At a typical marina, most boats are attached to a mooring fixed only at the bow and are able to move freely, aligning with the shifting winds and tides. In our case, if not moored by the bow and stern most of our boats—which can reach 25 feet in length—would swing into the stone walls of the Carroll Creek promenade. The lack of free movement with the wind means our craft are subject to strong broadside crosswinds and gusts which reached 40 to 60 miles per hour during three separate storms last year. Further compounding the challenge is the surface ice in Carroll Creek. Ice can form several feet in thickness, applying potentially crushing forces to our boat hulls. The Effects of Winter. The heavy oak and iron-clad Endurance, Terror and Erebus—and many other arctic exploration boats of years past—met their end as a result of ice compression and shear. The beautiful sparkling sheathing of ice common after freezing rains that often weighs down and snaps tree limbs and power lines may have a similar effect on our brightly lit rigging, spars and sails as well. Heavy ice contributed to the failure of the main deck hatches described in Gordon Lightfoot’s classic ballad, “The Wreck of the Edmond Fitzgerald” and sent her to the bottom of Lake Superior. Weighting Our Boats. The combined forces of tall masts, topside weight and wind can heel and capsize a boat on Carroll Creek. These forces are usually counteracted by fixed heavily weighted keels, often reaching up to 6 feet or more below the waterline. The deeper and heavier a keel the better it is for a boat’s stability. Our craft must be trailered to and launched from a spot on the Creek where the water depth below the hull is only 18- to 25-inches, making fixed deep keels impossible. To recreate the stabilizing forces of a standard keel, we use a variety of tactics. These include adding extra ballast to our holds and attaching heavy steel or concrete weights that are suspended directly under the hulls or to short retractable dagger boards and swing keels. The larger boats this year employ 1,400 to 2,400 pounds of stabilizing and anchor weights. Add Electricity. Finally, the multiple electrical connections on each craft and their shore power hook-ups are subject to the usual wet-weather problems we all know about. When you walk by a decorated boat on Carroll Creek this year take a minute to reflect on how they’re more than just pretty lights on the water. Shared strategies among multiple teams are at work trying to keep these crafty works of art floating and alight. The idea. The Hope Floats boat is sponsored by Colonial Jewelers, and was inspired by the efforts of owners Jeff and Patty Hurwitz to raise money to support local breast cancer patients. To that end, the Hurwitz Breast Cancer Fund was founded in the year 2000. To date, the initiative is approaching the $2 million dollar mark in total funds raised. Every dollar of that money has been used to purchase state of the art technology for the early detection and treatment of breast cancer patients at Frederick Memorial Hospital, and to support the Center for Breast Care and the James M. Stockman Cancer Center. Carroll Creek Fleet Admiral Pete Kremers steers the FMH Radiology Department when not at sea. He has been instrumental in research and implementation of the dollars raised by the Fund. So it was a natural fit that Jeff and Patty would want to support Dr. Kremers’ efforts, both to raise money and awareness for the fund, but also, as long-time downtown business owners, to help beautify the Creek in the cold of winter. Construction. Hope Floats was the creation of daughter Allison Hurwitz and Matt Distefano. They chose bright pink with delicate lights to symbolize the journey of breast cancer patients. The name refers to the Hope that the Fund is providing for women through advanced diagnostics and treatments. Colonial Jewelers is thrilled to have the opportunity to participate in the Winter Solstice project. Our charity. Hurwitz Breast Cancer Fund. The Idea. I’ve always loved impressionist paintings, especially the works of Monet and Van Gogh. In fact, Monet’s garden at Giverny was the inspiration for our own Color on the Creek water garden. 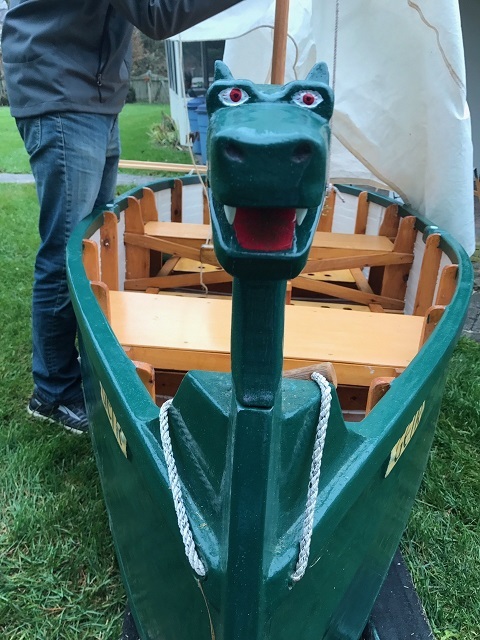 Earlier in2018, I happened upon a boat named “Vincent” on the Chesapeake Bay Maritime Museum auction website. Ironically, her lines and several white swirls painted on her bow reminded me of a Van Gogh painting titled Fishing Boats on the Beach at Saints-Marias. But it was thinking about another Van Gogh masterpiece—Starry Night—that really got my creative juices flowing. So much so that I purchased the boat at a premium before the auction. Construction. I struggled with design elements for the new boat and a starry night sail plan until my friend and accomplished artist Max Wingerd offered “a little help.” I was amazed how quickly his vision and artistic skills moved the project forward. With an ad hoc team including Rob Ringle, Rich Favarulo, Jerry Winnan, Robert Robey and others, we built a new deck and made many other necessary improvements to prepare Vincent for Frederick’s challenging new art genre aptly called arctic creek sailing. Josh Diffenbaugh, a talented painter, worked his magic on color designs. Then Max and I went to work on turning his design for the sail graphics into a reality. Max Wingerd. The painting Starry Night is a true rockstar in the world of fine art and has long been a favorite of mine. It represents Van Gogh’s discovery of the vibrant energy in darkness. That he painted it from his room in an asylum in San Remy France, which had bars on it to prevent his escape, makes it all the more powerful and amazing to me. Yet for all the movement of swirling and dancing stars,the painting has a symbol of stability and order right in the middle of it: a picturesque town, asleep, with a single serene church steeple rising in stark contrast to the dark hills beyond. Next time you look at a photo of the painting, you’ll see it. Minus a few spires, it could be Frederick! The idea of creating a Starry Night boat with Pete for FPCA (Frederick Primary Care Associates) was as daunting as it was exciting. Once we decided to go full speed ahead with the concept, the challenge was capturing the celestial energy of the painting with colored lights on the sails and recreating the sleepy little town below that sky. The sails were actually a fun thing to do in the dark. The town, with my limited power tool collection, was a bit more challenging. But it all came together beautifully. Of course, there were lots of hours devoted by lots of people in constructing, painting, water-proofing and readying the boat. My thanks to all! Now that Starry Night is float in Carroll Creek and all lit up, it just might make Vincent proud, too. Our charities. Heartly House, offering safety and security to victims of domestic and sexual violence. And FMH Cancer Patient Assistance Fund, helping patients and their families with the costs of medical care. Something beautiful is about to happen! Something beautiful is about to happen! Color On The Creek is going four seasons with Sailing through the Winter Solstice by Color on the Creek. Beginning this December, after an inaugural appearance in the Kris Kringle Parade on December 9th, Color on the Creek will introduce an initial “test boat” to be moored in Carroll Creek just west of the suspension bridge… hopefully in years to come she will be joined by many others as our flotilla is formed. The plan is to have small flat bottomed 5 to 12 foot Jon boats transformed into beautiful old world sailboats. Imagine eventually having 15 or 20 boats stretching from Court Street to the Iron bridge, including gaff-rigged ketches, yawls, three-masted schooners and pirate ships, moored with their sail outlines, rigging and decks lit up from dusk till dawn. If you can’t imagine it make sure to come by and take a look at year one. . . and then imagine what it will look like in years to come as the flotilla grows! All proceeds raised will flow to Color On The Creek and other participating Frederick County based charities. The event will run from the second week of December through the New Year’s Eve celebration.